Established in 1965, Nicholson Terrace is a 100 unit newly renovated high rise. This property has a fantastic view of the city. Its shady and peaceful tree lined campus conveniently located in the heart of historic Midtown Columbus. These cable ready studio-style units include water, central heat and air, refrigerators, stoves, utilities, and resident parking available. Nicholson Terrace gives its residents peace of mind with its secure access with resident issued entry cards and security cameras. We have an on-site office staff and our friendly maintenance staff is there to help you! The complex has several amenities including a laundry room, day room, a private library and a dining facility that can be reserved for meetings, gatherings and recreational activities. The Resident Opportunities for Self-Sufficiency (ROSS) program is an excellent resource for our Nicholson Terrace residents. ROSS offers exercise programs, health fairs, educational programs, shopping excursions and much more. Nicholson Terrace also has an established Resident Council and Task Force meetings for community security. 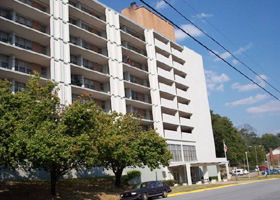 Shopping, restaurants, banks and a senior center are all located within close proximity to Nicholson Terrace. And, it is only a short walk to Weracoba Park at Lakebottom and various medical facilities. 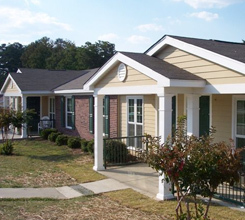 These affordable apartments are designed for occupancy by our senior and disabled families to give them a quality and enjoyable living experience.